Campbell & Kennedy is delighted to announce the completion of a design, manufacture and construction project to produce a bespoke solar carport solution for a large multi-storey car park in Sutton, South London. The solar carport investment has been self-funded by Sutton Council as part of its’ large solar PV programme, totalling an investment of more than £500k on solar PV developments across the borough. The Solar PV programme is one of several initiatives championed by the Council to reduce its carbon emissions and to increase its projected long-term energy resilience. The Council has set a very ambitious target of becoming a zero-carbon council by 2025. The overall programme of works was awarded to Campbell & Kennedy following competitive tender via the PfH framework. 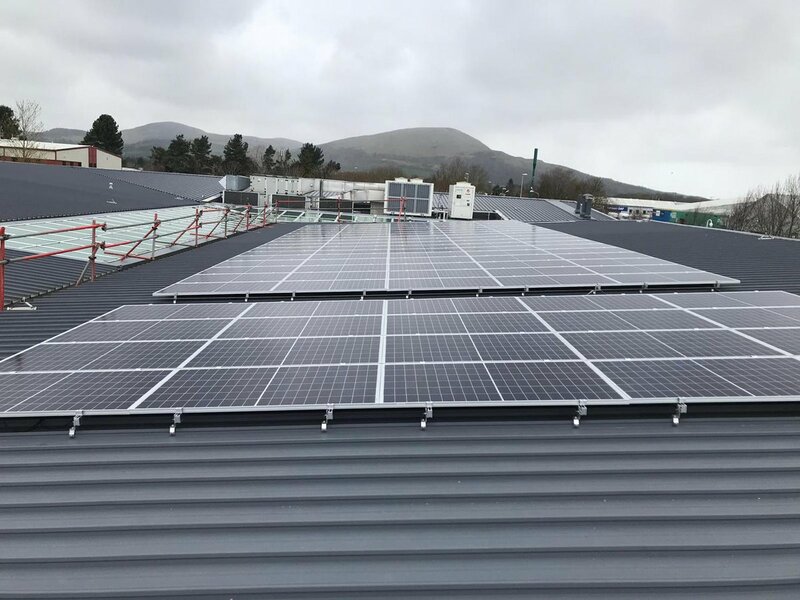 Following completion of a previous phase of PV installations for Sutton Council, Campbell & Kennedy then worked in partnership with FlexiSolar to develop the frame and solar panel rail system to optimise the multi-storey position of the site, whilst accounting for the weight limitations imposed. The resulting carport is sized at 133kWp, covers 57 car parking spaces and holds 492 solar panels. The system is expected to generate approximately 120,000kWh of energy per year, making the car park almost energy neutral, using only renewable energy to fully operate. Working closely together, logistical challenges were seamlessly dealt with by both the Campbell & Kennedy and FlexiSolar teams; using telehandlers to lift each and every component of the carport to its 14-metre-high site position, working within restricted height in between floors, and running the project overnight, without road closures, to limit disruption within the Sutton area. Speaking about its solar carport project, Ian Watts, Energy Manager at the London Borough of Sutton said, “This is a very exciting project, not only because financially it is an attractive proposition but also because we are creating a new landmark in the borough that will show our commitment to cut our carbon emissions. The Council is embracing the new digital era and this project is a clear statement of our commitment to adopt new green technologies as part of our daily operation. The delivery of this contract for Sutton Borough Council is the latest in a series of announcements from both Campbell & Kennedy and FlexiSolar this year, with Campbell & Kennedy listed within both the London Stock Exchange Group’s 1000 Companies to Inspire Britain and the Financial Times list of Europe’s fastest growing companies, and FlexiSolar announcing construction of the UK’s largest solar carport, at the Bentley Motors manufacturing headquarters in Cheshire.